Economics looks at how rational individuals make decisions. An important part of being a rational decision maker is considering opportunity costs. In our introductory section we identified the concept of scarcity. Normally we are quite good at considering scarcity when it comes to resources and money. What we are less good at considering is scarcity of time. 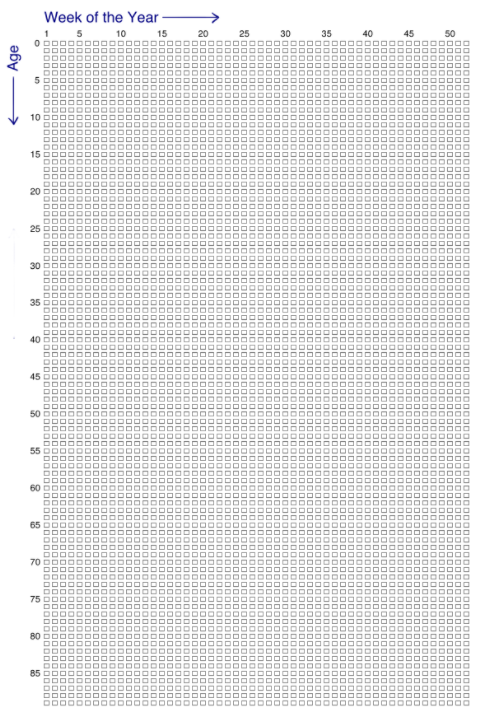 Consider the following image that shows the number of weeks an average human lives. Sometimes it kind of feels like our lives are made up of a countless number of weeks. But there they are—fully countable—staring you in the face. This isn’t meant to scare you, but rather to emphasize that a rational consumer doesn’t ignore time, but incorporates it into the analysis of any decision they make. So how do you ‘spend’ your time? In economics, we want to place a value on each different opportunity we have so we can compare them. What if your friends were to ask you if you want to go out to the club? How much do you value it? As economists, we want to measure the happiness you will get from this experience by finding your maximum willingness to pay. Let’s say that for a 5 hour night at the club, the MOST you are willing to pay is $100. Seem high? If you have gone clubbing, this is likely close to what you paid for it. Suppose the costs of going clubbing are $50 ($15 cover, $20 for drinks and $15 for a ride home). With that analysis it seems like you should go, but so far we have only considered the explicit costs of the experience. An explicit cost represents a clear direct payment of cash (whether actual cash or from debit, credit, etc). But what about our time? We must consider time as another cost of the action. How do we measure time? Simple – what else could we be doing with that time? Assume you also work as a server at the campus pub, where you get paid $15 an hour (including tips). This makes it easy to put a dollar amount on your time. For 5 hours of clubbing, you are forgoing the opportunity to earn $75 ($15 * 5). This is your implicit cost for clubbing, or the cost that has been incurred but does not result in a direct payment. It is important to note that the implicit costs are the benefit of the next best option. There are an infinite number of things we could be doing with our time, from watching a movie to studying economics, but for implicit costs we only consider the next best. If we took them all into account our costs would be infinite. Consider the two options side by side. This shows us something interesting. Even though we are willing to pay $100 to go out clubbing, our ‘happiness’ from working is greater. A rational consumer would chose to work. The $75 we could be earning from working is equal to our implicit costs of going out since, rather than going clubbing, we could be making money for the 5 hours. To truly consider costs we must always consider our opportunity costs which include the implicit and explicit costs of an action. Should you go clubbing? You are only willing to pay $100, and your opportunity costs are $125 so no! Does this mean you should never go out? Not at all. You just may be surprised that your willingness to pay may be well over $100. In our previous analysis we refer to the concept of “Total Happiness.” The problem is, happiness is not an easy value to measure. Daniel Bernoulli, an economist, first introduced the concept of utility as a means of measuring happiness. Classical economists will often assume that utilities can be measured as a hard number. In reality, it is must harder to measure the happiness a consumer receives from a good. Often, we will use the measurement of how much a consumer is willing to pay, but even this information can be difficult to assess. For the remainder of Topic 1, we will refer to happiness as something that can be measured, recognizing that this is rarely as easy as it will appear here. This consideration of opportunity cost is rooted in an understanding that all resources are scarce. The first image paints a compelling picture of the scarcity of time, and our financial resources are also scarce. Being a rational decision maker means considering the scarcity of all resources associated with an action. As decision makers, we have to make trade-offs on what we do with finite resources. This leads us to a fairly simple conclusion. We should do something if the benefits outweigh the costs. The key insight is that the costs we are referring to are opportunity costs, which consider the next best alternative use of our resources. It is important to note that not all decisions are binary. Just as it is important to understand the costs that should be considered in decision making, it is important to understand what costs should not. Consider the two options you may have when you wake up – do you work out or sleep in? Have you ever convinced yourself to get out of bed by reminding yourself that you paid $60 for your monthly gym membership? Well, you fell victim to a common logical fallacy. A sunk cost is a cost that no matter what is unrecoverable. As such it should have no impact on future decision making. This may sound strange, but consider the your two options using the analysis learned above for making decisions. Following our steps we find the maximum willingness to pay for each option, subtract the explicit costs, and compare the happiness from each. It does not matter that we spend $60 on a gym membership because no matter what we do we can’t get that money back. With this willingness to pay reflected in the table, the better option is to Sleep-In, with an opportunity cost of $20. Notice that the $60 is not included as an explicit costs because it is not an additional cost we have to incur as a result of working out. Since we have already paid the $60, it is no longer something we consider. Why Buy a Gym Membership? Why would one ever buy a gym membership? Well in this case, it might be a bad idea. The ‘willingness to pay’ represents how badly someone might want to go to the gym. If you knew that every morning you would wake up and value sleeping more than working out, then a gym pass might not be for you. If that was the case you would need to find a way to increase your willingness to go to the gym, for example, if you committed to a work out plan with a friend, the social cost of sleeping in may be high, incentivizing you to get out of bed. The important lesson here is to be mindful of your future motivation when you are incurring a sunk cost. Sunk costs aren’t exclusive to gym memberships, in fact, the sunk cost fallacy is common in big business and government. Ever heard the expression “we’ve invested too much in this project to back out now?” Even if you have not, it sounds fairly logical – unfortunately it is not. Consider a mining company that has invested $5 million in the infrastructure of a mine. After new information, they learn of another, richer mine site that they can mine for $4 million, with projected revenues of $8 million. The current mine site will cost $1 million to extract the remaining resources ($4 million projected revenue). What should the company do? Sunk costs are irrelevant for decision making. Want to know how you can avoid the sunk cost fallacy in your decision making? Read more here. the direct cost of an action, usually involves a cash transaction or a physical transfer of resources. Previous: 1.1 What Is Economics, and Why Is It Important? 1.2 Opportunity Costs & Sunk Costs by University of Victoria is licensed under a Creative Commons Attribution 4.0 International License, except where otherwise noted.